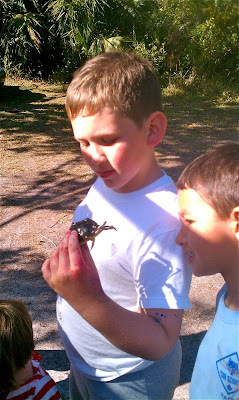 Exploring the Outdoor Classroom: Nurturing Nature?!?!? My 5 year old son brought to my attention the other day that an adult's idea of a creepy critter is another child's idea of a "pet!" It all came about when the 2's teacher thrust a bucket at me and proclaimed, "YOU are the Outdoor Curriculum Person...so YOU deal with this!" A bucket? Okay...take it to the sandbox. It wasn't until I looked IN the bucket that I realized why this particular bucket was being thrust my way. For, in the bucket was the biggest creepy-crawly I had ever seen (well, excluding the rhino beetle that flew into my sister and bruised her leg on a trip to Africa)! This thing looked similar to a giant ant. It had a bulbous bottom, huge pincers, large eyes, and it appeared to be trying to dig its way out of the bottom of the bucket with great gusto. Don't get me wrong, I love nature and I really don't mind most of the insect world. But this topped the charts on the "yick" factor scale (the quarter is in the container to demonstrate the size of the beast)! By the way, did you check out the pincers?!?! The 2 year olds were FASCINATED! I couldn't get the bucket away from them! "What was it? Where did it come from? Can we put it back in the sandbox where we found it? What does it eat? Can I hold it? Why not?" Oh, the questions they had! Aside from the teacher saying it was a "Potato Bug," I wasn't exactly sure what it was. So we pulled out the fancy internet-enabled phone and we Googled it! It was, in fact, a Jerusalem Cricket (also known as a Potato Bug). We found out all sorts of information and the children were so excited to watch the creature kick and squirm in the bucket. However, after their initial interest had waned, I knew the bucket was not an appropriate habitat. So what to do with this horrific little thing? I couldn't let him go on the playground since we learned it has a painful bite. So, I decided to bring it home to my young entomologist! My 5 year old was beyond THRILLED! We researched everything we needed to know about housing his new "pet." Unfortunately, we didn't read as far as keeping a lid on the box, so the critter is now somewhere in my house. Shudder the thought! This particular critter in the photographs is actually Potato Bug #2 to reside in our house. I found this one hanging out in one of the plastic construction hats that were sitting out in a crate in the play yard (how he got in there is beyond me!). This one has a name ("Crusher"), a lovely terrarium habitat (complete with lid! ), and a delectable feast of fruits and veggies set out just for him. He is my son's pride and joy! So, as the saying goes, one man's garbage is another man's treasure! Here is "Crusher" trying to burrow into his new habitat. Bugs and other critters provide endless hours of fascination for young children. If we, as teachers, can overcome our own fears, there is a wealth of learning to be had from nurturing nature. 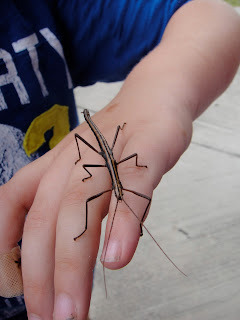 Insects are often the easiest to find in your backyard, but other critters such as lizards, snakes, or amphibians would also be welcome guests for your students. There are dozens of books and websites that offer practical and easy-to-follow information on caring for insects & backyard animals at the amateur level. Discussing these creatures with the children will increase knowledge and respect for the animals that reside in their own backyard. A teacher can easily facilitate a deeper understanding of the animal by providing books and photos for the children to explore. Researching animals with the children allows them to understand the animal's physical appearance, species, habitat, food, predators, sensitivities, life-cycles and habits. Allowing children to watch the animal in a carefully planned and contained environment enables the children to study the animal more carefully and gives them direct experience in providing for the needs of another living creature. They can discuss, observe, predict and record the various behaviors of the animal. 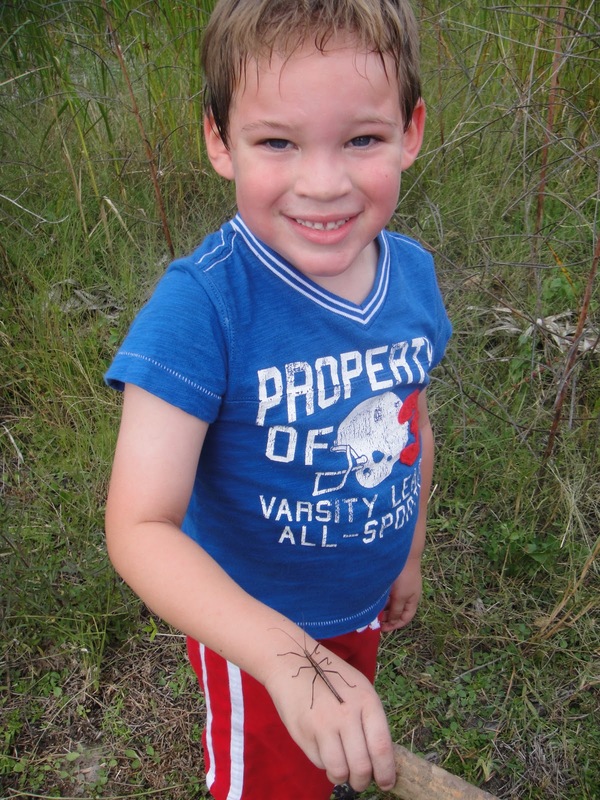 My little "entomologist" holding a stick bug in Florida. Setting out journals may entice the children to take notes or draw diagrams of the animal. The young scientist will be thrilled by this up-close encounter with nature's wonders. Howard Gardner even recognized "Naturalistic Intelligence" as a recent addition to his list of Multiple Intelligences. Of course, keep in mind that some animals would be better off if released after a few days of observations. Other animals are perfectly happy living in a child-made setting if all of its needs are met. If you live in an area that is habitat to venomous, stinging, or biting insects/critters, it is always best to train students to show the teacher before touching any animal! Safety first! Following are a few helpful insect websites in setting up your own window-sill science center. You can also just Google "caring for (name of critter)" and see what comes up. Google images is a great way to get some splendid photos of the critters you are hoping to keep. I hope you find these as interesting as I do! Getting a close look at a butterfly at the zoo. So much great information here! Thanks for sharing. I couldn't agree more with the benefits of critters for little ones. No fear from this momma (or when there is I hide it pretty well!). Thanks for joining the outdoor play party this week. Be sure to tell your readers about the link up and where they can find it. We would love to have even more ideas posted and people visiting the blogs that join the party! Thanks, Abbie! I am usually fond of most creatures, but this one took me by surprise! But, as you can see, I got over it and he now lives in my home ;-P.
Thanks for linking up to the Outdoor Play Party and sharing the link. If you like, it might be easier to copy and paste the Outdoor Play Party button into your post or sidebar (I'm working on getting a proper grab code for it) and linking it back that way. Dramatic Play Ideas - Outdoors! Fun, Fun, Fun in the Outdoor Classroom!